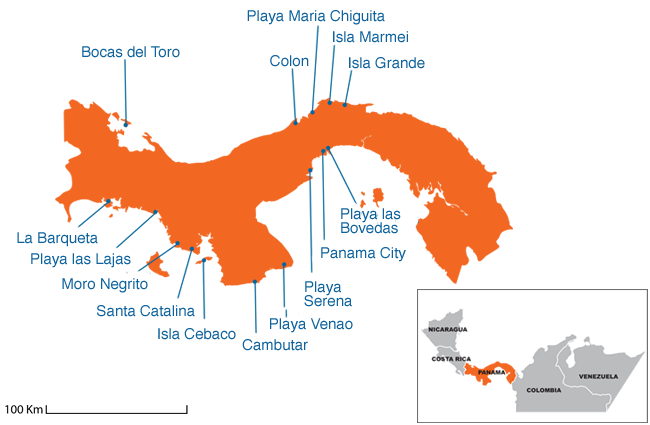 Any surfer who's ever glanced at a map of Central America has no doubt admired Panama's curving, south-facing west coast. There are still some areas of Panama that can be surfed by yourself with just a bunch of your friends. Few people know about Panama's surfing potential, and it still remains off the radar for the majority of the surfing community, which is a big plus for surfers who come to stay in Panama surf camps. There is very little information on how surfing in Panama first took off but there a few rumours that lend their own take, one being that it was during the 1960’s when US surfers were surfing in neighbouring Costa Rica and decided to explore to the east in search of new waves. The other theory is that foreign sailors who were using the Panama Canal would dock and explore the region with their boards, keeping the locals on the beach entertained with their surfing skills. What’s the surf like in Panama? Panama surf spots are some of the best surf breaks in all of Central America! Whether you like point breaks, beach breaks, hollow tubes, or long walls, Panama has a variety of breaks to accommodate everyone’s style and ability. In regards to the Panama surf season, the Pacific side is best in the months between April and November. Whilst the Caribbean side is best between December and March, and can get swells any time of the year but can experience flat spells between September and November. Panama's roads are some of the best in Central and South America, with highways all over the country for quick access to the huge variety of surf breaks. The transportation system is very good, and buses and taxis are readily available from the international airport. You’ll find some of the best Panama surf spots on Isla Bocas del Toro, from hollow beach breaks to long peeling walls; you can access Isla Bocas del Toro by land, boat ferry or aeroplane. The islands are known for their exotic wildlife which includes sloths, monkeys, red frogs and birds, as well as a host of fun filled activities such as snorkelling, kayaking, fishing, island tours, a unique waterfall spa, hiking trails that lead to secluded beaches and a two-hour zip line canopy for those wanting an adrenaline hit away from surfing! Bocas del Toro is home to some great Panama Surf camps. There are also a good selection of cafés, restaurants and bars that serve all kinds of local and European foods, with barbecued meat and fish being a speciality. Some great waves can be found at the Playa Bluff but once it passes over head height, should only be surfed by those seeking the best advanced and intermediate surf Panama has to dish out. There are many waves that are a short boat taxi away which will be taken care of by our guides. At Red Frog Beach, you’ll find left and right walls breaking over sand and rock, offering the chance to practice your turns with some of the best beginner surf Panama has to offer, as well as some other unnamed waves near it. This area is relatively unexplored and has been described as the ‘Galapagos of the 21st century’ so is the perfect destination to get away from modern world living and get back to nature. There are many small islands around Colón which are the perfect place to snorkel, pretend you’re the only people alive and of course, surf in total paradise.Our favourites include the Isla Grande which has three peaks and neighbouring island Isla Mamei which has a left-hand point break that is best surfed by intermediate surfers. The Colon / Porto Belo area has several spots worth mentioning that are best surfed between December and March. To get there from Panama City, you go down the new toll road highway Corredor Sur towards Colon City, then on to La Guayra where you catch the boats to Isla Grande, where you will find Playa Maria Chiquita, which is a great beach for beginners with both lefts and rights making for a fantastic Panama surf camp experience. Panama City has a few different surf breaks which require a big swell for these spots to break, but can offer a great option if you are getting your cultural fix in whilst wanting to get in the water. Playa Las Bovedas is located directly in front of the Presidential Palace in the area of "Las Bovedas". It is a rock and sand bottom point break with rights and lefts, is best at medium to high tide and is suitable for all ability of surfers, offering up a lively and fun Panama surfing experience. The area is known for its rich history with statues of famous natives of Panama. There is a great restaurant called "Restaurante las Bovedas", which has fantastic seafood and colourful history, as well as a wonderful and lively atmosphere. The restaurant itself was built inside of an old jail that the Spanish used to drown pirates, locking them in a cell and waiting for the tide to come up! The Pacific coast area near Panama City is much cleaner than the city breaks, and gets much better surf. They are located 1 hour drive west from Panama City, over the Bridge of the Americas. Playa Serena is located in the town of Coronado, and is a great place for people new to the world of surfing thanks to long right hand waves that are slow on take-off. This allows you enough time to get to your feet before walling up, enabling you to trim across the wave. The town itself is great for shopping, letting loose in the vibrant night life and enjoying delicious food in beautiful surroundings.You’ll find great conditions for your Panama surf holiday in this area, such as Frente de Teta, The Point, Rinconsito and Little Hawaii. The province of Los Santos has some of the best Panama surf spots as it is located out on the peninsula of Panama. The west-facing coast of Veraguas Province and the south coast of Los Santos contain some great river mouth points and some good quality reefs, that have enough water over them to appeal to beginner and intermediate surfers, with fantastic beach breaks such as Cambutal, Playa Venao and Boca de Oria which can be great to learn to surf, Panama has it all! To get there, you can travel by rental car, bus or taxi down the Pan American highway, then take a left at Divisa, go through Chitre, then through Las Tablas, and on to Pedasi. At Pedasi, the beaches begin, and run all the way through Tonosi to the end of the road at Cambutal. Los Santos is home to Panama’s wildest and best carnivals, with colourful folkloric celebrations taking place throughout the year with extravagant displays of traditional dresses and dances. It’s also the home of Panama’s best displays of nature where you can watch sea turtles nesting by the thousands at Isla de Cañas and snorkel one of the Pacific's largest coral reefs at Isla Iguana. If you are surfing in Panama then there are a growing number of reasons to stop here, including the stunning marine life in Parque Nacional Coiba and the glorious mountains of Santa Fé. Travelling to and in the area is relatively simple as most destinations are accessed from the Interamericana, with the majority of attractions within easy reach of the provincial capital Santiago. The province of Veraguas has some of the best Panama surf spots, with the majority of the main breaks all close to the town of Santa Catalina. The main point break is located around the point from the town, with both left and rights working and different stages of the tide providing waves for all abilities, making it a great place to spend some time at one of the areas Panama surf resorts. Estero beach break provides great learn to surf waves, with slow peeling left and rights breaking over a soft sand bottom. Best surfed at low tide. Isla Cebaco is a large island located directly to the left of Santa Catalina. A great place to spend the day with three breaks on the island, as well as a perfect place to spot whales, sharks, large red snapper and grouper. Chiriquí Province is the nearest provence tp Costa Rica on the south coast. This area is relatively unexplored and offers the perfect respite from the trappings of modern life. Sit back and sip on a jugo de caña (sugarcane juice) while contemplating what waves to surf next. Spend a few days exploring the Chiriquí Highlands, a beautiful region of cloud forests, fertile valleys and impressive mountain scenery. Home to national parks including Volcán Barú and La Amistad that offer wonderful natural encounters and endless hiking opportunities. The inland town of Boquete has many attractions of its own, and is a must visit for coffee lovers wanting to sample and stock up on some of the finest coffee in the world. It’s also home to some hot natural springs and world class white water rafting. Playa Las Lajas is a beach bottom break with rights and lefts that is located right before the town of David, and is a great place to unwind after a day surfing in Panama, as this area is where the locals come to let off steam, sink a few rums and dance the night away! La Barqueta is where a lot of competitions are held and is best surfed on a medium to high tide, usually in the morning when conditions are glassy. The province of Chiriqui has several islands in the Pacific that have really good surf, whether you’re new to the sport or wanting to progress your skills to the next level. With many boat tours for the island it’s a great place to head for a few days for a true surf mission and offer you the chance to experience some true isolated Panama surf conditions. The area is well known for its fishing, which is a great sport to try in between surfs, even if you don’t catch anything, you are relaxing in a true unspoilt paradise. Morro Negrito is located on the mainland, but you have to get there by land, then boat ride. To get there you drive on the Pan American highway, after arriving near the small village, you hop on the boat to the town. Once there you will find a left point break over a rock and sand bottom that offers great rides. There are 4 other waves here, including a great beach break and a river mouth sand bottom break that gets good lefts and rights when there is swell. Panama surfing holidays are pleasantly warm. The country enjoys temperatures that are fairly consistent all year round, with daytime temperatures reaching between 30-34°C and night time temperatures between 21-24°C. It’s hot and humid, with heavy rain downpours that subside after an hour or so during May to November, which is known as invierno. During verano, which is December to April, you will experience more comfortable conditions with lower humidity, and the early part of the year experiencing little to no rainfall. Boquete, Cerro Punta and El Valle can get a little chilly at night so pack a long sleeve top and trousers. If you are planning to go into the highlands, pack a heavy rain-proof jacket as it is known to have torrential down pours for an hour or two late in the afternoon. The water is warm in Panama all year round, it never drops below 27°C and can reach 29°C in some places, so board shorts are more than enough; a rash guard is always advisable, as well as a hat to wear in the water to offer some protection from the sun.